Dr. Bunin’s extensive experience and specialized training in the tissues of the face, eyelids, eyes and skin, set her apart from other doctors. With her combined training in ophthalmic plastic surgery and ophthalmology, Dr. Bunin has an enhanced ability to perform delicate procedures around the eyes such as eyelid surgery, also known blepharoplasty. With her unique expertise, Dr. Bunin can perform eyelid surgery to repair a number of functional problems or address cosmetic issues. Functional Blepharoplasty: can be medically necessary in order to restore the normal protective function of the eyelids and restore a full field of vision. Cosmetic Eyelid Surgery: is generally perceived as a beautification procedure rather than as the repair of a physical flaw. Cosmetic eyelid surgery is not covered by insurance. Before and after images of a Brow Lift combined with lower eyelid surgery. Note: Upper eyelids were not changed. Patient with “heavy eyelids” caused by low brows. After ptosis surgery to elevate droopy lids, he looks better and can see better. Droopy Eyelids (Ptosis): Ptosis is a medical term for the droopy upper eyelid, which covers part of the cornea and interferes with peripheral vision. Much like a window shade pulled part way down blocks the upper part of the window; a droopy eyelid can block the upper part of your vision. Surgical repair to elevate the eyelid, much like lifting up the window shade, can restore your peripheral vision. Many times this is covered by insurance. 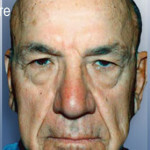 Baggy Eyelids (Blepharocholasis): Baggy eyelids can cause a person to look tired, run-down, older, and even angry. They can also interfere with vision and comfortable use of the eyes. Blepharoplasty consists of removing the excessive skin, muscle, skin folds, and sometimes underlying fat pads in the upper and lower lids. This is done not only for improvement of a person’s appearance, but in many cases, to improve vision, particularly when the upper eyelid has hooding skin which obstructs vision or causes fatigue. The intended effect of the eyelid surgery in the upper eyelids is the creation of a new, normal-appearing lid crease and elimination of the hooded, puffy appearance. There are some people who may require more than the usual surgical procedure to produce these desired effects. These extra surgical adjustments can be performed at the same time as the usual surgery. This additional surgery may be necessary in patients who have an unusual looseness of their eyebrows, causing them to droop over the upper-lid area. If this is the case, a brow lift or brow fixation can be performed at the same time as the upper-lid blepharoplasty, producing a much better effect in the upper-lid area. Turned Out Eyelids (Ectropion): In the lower lid, there may be extra looseness of the tendon, allowing an out-turning of the lower lid. Or there may be so much laxity of the cheek tissue that it pulls the lower eyelid down. 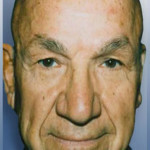 If so, tightening of the tendons of the lower eyelid and even elevation of the cheek tissue may need to be done in order to put the lower eyelid back into its proper position to allow better closure of the eye.In the lower eyelids, an invisible approach can be used to remove the fat bags from inside the eyelid, requiring no stitches. The excessive skin can then be removed using laser resurfacing, rather than being cut off and closed with stitches, leaving a smoother, non-baggy appearance.Because the eyelids affect vision, a surgeon specially trained in ophthalmic plastic surgery can best perform these procedures. With over twenty years of experience, Dr. Bunin’s unique expertise allows her to provide each patient with their best aesthetic results. Turned In (Entropion): Epiblepharon is a condition in which a horizontal redundant skin fold under the eyelid induces an abnormal vertical orientation of the eyelashes, often resulting in the eyelashes touching the eyeball. Congenital entropion can occur in conjunction with congenital epiblepharon. The causes of congenital epiblepharon or entropion include improper development of the lower eyelid. Epiblepharon tends to get better by itself as the patient grows, whereas entropion does not. The treatment of epiblepharon depends on the presence of corneal damage caused by lashes scratching the cornea. The treatment of congenital entropion is surgical. 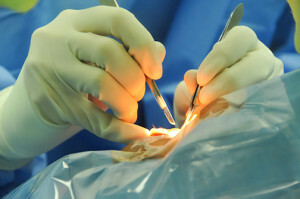 Surgery can be delayed as long as the corneal findings are not severe. Located in Lehigh Valley, we serve the cities of Allentown, Bethlehem, Easton, Coopersburg, Quakertown, Emmaus, and the surrounding Eastern Pennsylvania communities. In order to schedule an appointment or receive more information about a procedure, please call our office at call (610) 435-5333.